I was watching Channel 4 news, and what struck me for the first time was that Channel 4 appeared to have a more clearly defined and clearly expressed position on the issue they were reporting than did any of the politicians they were interviewing. 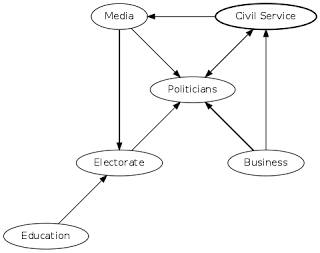 MPs get paid by the government, which is extra resource to the parties not counted in their budgets, and The civil service plays a role in developing policies for the ruling party, but MPs are paid to be MPs, not to develop policy, and the civil service has its own goals and constraints and is not under the control of the Labour party. First, I should be less sceptical than I have been about the “power of the media”. I previously felt that, since the media is constrained to doing what gets it audience, its independent influence on policy is small. However, if what it needs to do is to provide some alternative policy with which to challenge politicians, but it has relative freedom to choose which alternative to develop, then its independent influence is greater than I had thought. Boris Johnson’s election as Mayor of London in 2008 is consistent with the theory that politics is a branch of the entertainment industry. Boris won because people liked him on TV, not because they had any confidence he’d do a good job. In fact, it simply doesn’t matter whether he does a good job or not. In conclusion, I think our system of government is one which selects leaders and policies as a byproduct of the entertainment industry. This might not be a bad thing: the traditional alternative is to select leaders and policies as a byproduct of the defense industry, which has its own problems. I have long ago observed that, whatever its effect on government, democracy has great entertainment value. We are certainly being entertained by the last couple of days, and that looks like going on for a while. From one point of view, the election is a setback for neoreaction. The overreach of progressivism, particularly in immigration, was in danger of toppling the entire system, and that threat is reduced if Trump can restrain the demographic replacement of whites. On the other hand, truth always has value, and the election result has been an eye-opener all round. White American proles have voted as a block and won. The worst of the millennial snowflakes have learned for the first time that their side isn’t always bound to win elections, and have noticed many flaws of the democratic process that possibly weren’t as visible to them when they were winning. Peter Thiel’s claims that democracy is incompatible with freedom will look a bit less like grumblings of a bad loser once Thiel is in the cabinet. Secession is being talked about, the New York Times has published an opinion column calling for Monarchy. One might hope that Lee Kuan Yew’s observations on the nature of democracy in multi-racial states might get some currency over the next few months or years. So, yes, President Trump may save the system for another two or three decades (first by softening its self-destructive activities, and later by being blamed for every problem that remains). But Anomaly UK is neutral on accelerationism; if the system is going to fail, there is insufficient evidence to say whether it is better it fail sooner or later. If later, it can do more damage to the people before it fails, but on the other hand, maybe we will be better prepared to guide the transition to responsible effective government. We will soon be reminded that we don’t have responsible effective government. Enjoyable as fantasies of “God Emperor Trump” have been, of course the man is just an ordinary centre-left pragmatist, and beyond immigration policy and foreign policy becoming a bit more sane, there is no reason to expect any significant change at all. The fact that some people were surprised by the conciliatory tone of his victory speech is only evidence that they were believing their own propaganda. He is not of the Alt-Right, and the intelligent of the Alt-Right never imagined that he was. For the Alt-Right, if he merely holds back the positive attacks on white culture, he will have done what they elected him to do. Progressives can argue that there can be no such thing as anti-white racism, and that whites cannot be allowed the same freedoms as minority groups since their historical privilege will thereby be sustained. But even if one accepts that argument, it doesn’t mean that those who reject it are White Nationalists. Blurring the two concepts might make for useful propaganda, but it will not help to understand what is happening. My assessment of what is happening is the same as it was in March: I expect real significant change in US immigration policy, and pretty much no other changes at all. I expect that Trump will be allowed to make those changes. It is an indication of the way that progressive US opinion dominates world media that people in, say, Britain, are shocked by the “far-right” Americans electing a president who wants to make America’s immigration law more like Britain’s–all while a large majority in Britain want to make Britain’s immigration law tougher than it is. The fact that US and world markets are up is a clue that much of the horror expressed at Trump’s candidacy was for show, at least among those with real influence. In a very homogeneous society, polling may be easier, because there’s less correlation between what candidate a person supports and how they behave. But the more voting is driven by demographics, the less likely the errors are to cancel out. If arbitrary assumptions have to be made, then the biases of the analysts come into play. But that doesn’t mean the polls were wrong because they were biased–it just means they were wrong because they weren’t biased right. On to the election itself, obviously the vital factor in the Republican victory was race. Hillary lost because she’s white. Trump got pretty much the same votes Romney did; Hillary got the white votes that Obama did in 2012, but she didn’t get the black votes because she isn’t black, so she lost. So what of the much-talked-of emergence of white identity politics? The thing is, that really happened, but it happened in 2012 and before. It was nothing to do with Trump. The Republican party has been the party of the white working class for decades. Obama took a lot of those votes in 2008, on his image as a radical and a uniter, but that was exceptional, and he didn’t keep them in 2012. The exit polls show Trump “doing better” among black people than Romney or McCain, but that probably doesn’t mean they like him more: it’s an artifact of the lower turnout. The republican minority of black voters voted in 2016 mostly as before, but the crowds who came out to vote for their man in 2008 and 2012 stayed home, so the percentage of black voters voting Republican went up. The big increase in Trump’s support over Romney from Hispanics is probably not explainable the same way. A pet theory (unsupported by evidence) is that they’ve been watching Trump on TV for years and years and they like him. The lesson of all this is that, since 2000, the Democratic party cannot win a presidential election with a white candidate. There’s a reason they’re already talking about running Michelle Obama. They’ve lost the white working class, and the only way to beat those votes is by getting black voters out to vote for a black candidate. While we’re talking about precedents, note that the last time a Democrat won a presidential election without either being the incumbent or running from outside the party establishment was 1960. Update: taking Nate Silver’s point about the closeness of the result, my statements about what’s impossible are probably overconfident: Hillary might have squeaked a win without the Obama black vote bonus, maybe if her FBI troubles had been less. Nevertheless, I think if the Democrats ever nominate a white candidate again, they’ll be leaving votes on the table unnecessarily. Back then, the main threat I was concerned with was state action directed against service providers being used for copyright infringement. Since then, my political views have become more extreme, while the intolerance of the mainstream left has escalated alarmingly, and so the main threat today is censorship by service providers, based on their own politics or pressure from users and/or advertisers. Actually publishing content has become easier, due to cheap virtualised hosting and fast residential broadband, making a few megabytes of data available is not likely to be a problem. The difficult bit is reaching an audience. The demise of Bloglines and then Google Reader has been either a cause or a symptom of the decline of RSS, and the main channels for reaching an audience today are facebook and twitter. I don’t actually use facebook, so for me twitter is the vital battleground. If you can build up a following linked to a twitter ID, you can move your content hosting around and followers will barely be aware it’s moved. Last week’s Chuck Johnson affair defines the situation we face. We require a robust alternative to twitter—not urgently but ideally within a 12–24 month timeframe. I’ve been running the Twister peer-to-peer twitter clone for a couple of weeks, and I think it is OK. Primarily, it is built on top of the bittorrent protocol. Messages are passed from node to node, and nodes collect messages that are relevant to them. In addition, it uses the bitcoin blockchain protocol. This is not for content, but for the ID database. Content published by an ID must be signed by the key associated with that ID, and the association of keys with IDs is made via writing entries into the blockchain. Ownership of IDs is therefore “first come, first served”, with the ordering of claims determined by the blockchain (just as the order of transaction attempts is determined for bitcoin, preventing double spends). As an incentive to build the blockchain, each block can include a “spam message” which will be presented to users. What that means is that there is no authority who can disable a user ID or take it over. If the ID is registered on the twister blockchain with your public key, it is yours forever. The application runs, like the bitcoin reference client it is based on, as a daemon offering a JSON-RPC socket interface. It also serves some static web pages over HTTP on the same port, providing a working twitter-lookalike web client. As far as I can see, it works properly and reliably. I am running it over Tor, and that works fine. It’s still treated as experimental by the authors, so it’s not surprising if it’s not complete. The biggest shortcoming is that it’s inconvenient to run. Like bittorrent, it needs to find peers and build a network to exchange data with, and, like bitcoin, it needs to keep up with a blockchain. (It is not necessary to “mine” or build the blockchain to use the service). You really need to start it up and leave it running, if not 24/7, at least for hours at a time. For the same reason, it doesn’t run on mobile devices. It could be ported, but staying on the peer-to-peer networks would be an inconveniently heavy use of data, battery and processor resources. Fundamentally, you don’t see all the traffic (that wouldn’t scale), so you can’t conveniently search it. You need to advertise that you are interested in something (by following a user, for instance), and gradually it will start to flow your way. The network is currently very small-scale, so it remains to be seen how well it would scale up to a useful size. I don’t understand the torrent / DHT side of things all that well, but as far as I can see it should hold up. The ID blockchain functionality seems more reasonable. If each new user requires of the order of 64 bytes of blockchain space, then ten million users would need about a gigabyte of disk space to archive. A lot, but not prohibitive. As with bitcoin, the hope would be that users would be able to use lightweight clients, with the heavy network functions semi-centralised. Also as with bitcoin, the most difficult obstacle is key management. When you want to start using twister, you generate a key pair, and post a transaction associating your public key with your chosen twister ID. You need the private key to post twists, or to see private messages. If you lose the key, you’ve lost your ID. If someone gets your key, they can post as you and read your private messages. Handling keys securely is difficult. For a casual user who isn’t too concerned about surveillance or censorship, it’s prohibitive. Like bitcoin, the network node, blockchain archive and wallet (user ID) are all managed by a single process. Logically, the private operations of creating authenticated transactions/messages ought to be separate from the maintenance of the network node. Twister is designed for those who are concerned about surveillance or censorship, but we need to be able to talk to those who aren’t. It needs to provide security for those who need it, while being as easy as possible for those who don’t. The system seems fairly robust to attacks, including denial-of-service attacks. Media companies have attempted to interfere with bittorrent, but have not as far as I know blocked an actual running torrent, rather concentrating on the chokepoints of communicating knowledge of specific torrents. The ID subsystem could be flooded with new id requests. There is a proof-of-work requirement on individual “transactions” (new id assignments), separate from the actual block proof-of-work, but that cannot be too onerous, so a determined adversary could probably produce tens of thousands. However, miners could respond by being fussier about what they accept, without breaking the protocol. The blockchain itself is vulnerable. The hashrate at present is about one quarter-millionth of Litecoin’s (which uses the same hash method), so one block of the twister blockchain currently costs about the same in compute resources as a thirtieth of a cent worth of Litecoin. (I have mined dozens of blocks myself over the past week). Anyone with a serious GPU-based mining rig could mine hundreds of blocks in minutes. The incentive for legitimate miners is always going to be weak, since a customised client can trivially ignore the “spam” messages. However, it does not seem obvious that that is a real problem. The value of the blockchain is that it established ownership of IDs, but an ID is not really valuable until it has been used for a considerable period, so to take over a valuable ID, you have to fork the blockchain from a long period in the past. Even if you have the hashpower to do that, your blocks are likely to be ignored simply by virtue of being so old. However, there is another requirement to do that, which is more sophisticated key management. Mobile devices and third-party service providers would hugely improve the convenience and usability of the service, but at a cost of crippling the security, since neither one is sufficiently trustworthy to hold the private key. What I have suggested is a system of subkeys, with restricted delegated authority. I create my key pair and post it to the network with my chosen ID, as per the current protocol. Then, I can create a new key pair, and create a transaction signed by my original key (which I call the “master” key), delegating the authority to make posts for a limited time (a week, say) to this new key (which I call a “subkey”). I transfer the private key of the subkey to my phone app, or to a service-provider I trust, and can then make posts using the subkey. After the week, that subkey is expired and posts made with it will no longer be accepted as valid by other clients or network nodes. If the key is compromised, the damage is limited. I could even post a “revoke” transaction signed by my master key. @jokeocracy has pointed at Trsst. Also, GnuSocial is quite well established. Both of these are federated client-server architectures. See quitter.se as an example GnuSocial-based service provider. (It would be funny if we were to all move en bloc onto some lefty-oriented “free from capitalism” platform, and perhaps instructive, but not necessarily a long-term solution). There is some resistance to censorship there, in that if one service provider blocks you, you can switch to another. However, your persistent ID is tied to the service provider you choose, which could take a dislike to you or (equally likely in the early stages) just go away, so it makes it harder to maintain continuity. Also, the federation model does not necessarily prevent the consumer’s service provider from censoring your messages to its customers. The customers can switch if they want to, but not trivially. In the case of Trsst, it strikes me that this is a mistake: users have private keys, but the association of keys to IDs, unlike in the case of twister, is made by the service provider. If mentions, replies, and subscriptions were by public key instead of by “nickname”, users could migrate more painlessly. However, that registry would have to be distributed, adding complexity. In the long run, what I would hope to see is a service that looks like quitter.se or Trssst, but acting as a proxy onto the Twister network, ideally with short-lived subkeys as I describe above. Other relevant projects not ready yet would are Urbit (of course), and chatless (by @_raptros).